Covered: gas masks, helmets, gloves, armor, signs, radios, earplugs, metallic-fibers, and first aid kits. Reprinted from Steal This Wiki. A modern military style gas-mask is a great big “arrest me” sign. If you insist on having one, then buy an American or Israeli mask with Plexiglass or Lexan eye-protection. A lot of old-fashioned Soviet gas masks are available, but the eyepieces are glass, and therefore breakable — Remember: the Revolution is all fun and games until someone loses an eye — so try to avoid them. A good model of mask, if you can’t get a new one, is either the German M10, or Israeli M15 both are practically bullet-proof, and will run you about 30-40 dollars online. Russian cold war surplus gas masks, while both cheap, and usable, have glass eyepieces, but these can be replaced at any decent hardware store for plexiglass ones for a couple of dollars. Unfortunately the filters from the cold war are rather large. A good substitute to a military gas mask is an industrial respirator. These don’t protect the eyes, but are useful when equipped with organic matter/particulate filters — be sure of the filter rating, since normal filters only protect from dust and asbestos, etc. N95 (protects against 95% of particulate matter) and P100 ratings are good for CN gas (Mace) and CS gas (teargas). 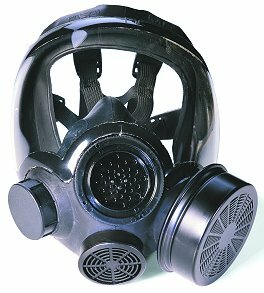 Respirators can be bought for $40-50 at most large hardware and farm-supply stores, and the filters are commonly available. Buy a good set of swimming goggles to go with them. Remember that, during an arrest, any gas mask or respirator is going bye-bye forever. If gas masks are unavailable or too expensive, or if you’re involved in an action where arrest is inevitable, you might want to fall back on the old standby: a bandanna soaked in a mix of cider vinegar and water. Get a large, good-quality bandanna (cheap dollar-store bandannas usually don’t fit the bill) and soak it in a mix of 1/3 cider vinegar to 2/3 water. You can keep it damp in a ziplock bag, and tie it around your face when the gas starts flying — it’s not perfect but it’s a hell of a lot better than nothing. A fair warning to people looking to purchase a gas mask: many older gas mask filters are no longer usable, especially if they are over 10 years old. Make sure to do your research on any particular gas mask you are considering purchasing to make sure you can still obtain gas mask filters for it. Also check for damage and cracks that would compromise the mask’s effectivness. Current models that are most likely to work and have filters available: M17A1 NBC (nuclear, biological, chemical), M95, and more that you can research (for example, the MSA Advantage 1000 CBA/RCA Mask). 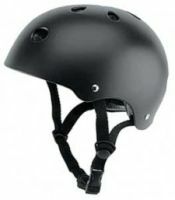 The standard BMX helmet makes a good quality working helmet because it is extremely lightweight, designed to stand up to repeated blows, comfortable, allows you to wear a gas mask, protects the ears, and can be painted with whichever rude slogans or symbols you choose. The modern CS gas canisters burn at several hundred degrees, far hotter than is safe for normal cotton or light work gloves. When handling a hot canister, you will need the full grain leather gloves or you risk burns. Often viewed as an easy way to avoid leaving fingerprints on stuff, but the latex glove itself leaves a unique pattern which can be traced to a specific glove… and you leave your fingerprints inside the glove. Be sure to thoroughly dispose of any latex glove used when fingerprinting issues may come up. Back before the Quebec City summit in 2001, “armoring” was used as a response to police violence. This varied from taping rigid plastic or cardboard over kidneys to elaborate suits of plastic-barrel armor taken from SCA plans. For the most part, armoring is now unpopular. The Quebec City protests proved that mobility was more important than armor, and heavy armor is now rare. Most activists should content themselves with a jock-strap and maybe a chest-protector (both available from sporting goods stores). Knee-pads are useful, though especially if you’re going to do a lot of kneeling at a protest — for example, being a street medic. For those considering investing in Kevlar body armor, note that while it is legal for civilians to own in the USA (for now), using it “in the process of a criminal act” is a Felony. Also remember that while Kevlar will stop MOST handgun bullets, it won’t stop them all, nor will it block the massive force that the rounds will hit you with. Your sign is also a shield from the cops if made correctly, choose a good piece of wood for the post and consider backing your posterboard with corrugated plastic like is used on election signs. Have an intelligent but simple message on your sign, a confusing sign is worse than no sign. If you are an organizer make a silkscreen and mass produce signs so you can easily convey a unified message in the print and TV media. A small power-hacked FM transmitter is a way to communicate during a protest, revolutionary slogans or instructions can be sent from a transmitter hidden in a protest sign, bicycle, or other hiding place. Protesters can either blast your stuff with cheap boom-boxes or take orders with throw away transistor radios and headphones. FRS radios are now available in the USA, 14 available channels means you can usually find an open channel. Do not be fooled by the privacy codes, these are not encryption, just a blocking circuit that does not activate the receiving radio sound unless the sender radio first sends the electronic activation tone. Assume all transmissions are being intercepted by the pigs. For their current low price the utility, even in hi-rise urban areas, is amazing and they are free to use unlike cellphones. Police have access to new advanced technology, we have access to countermeasures. The sonic stunner comes in two forms: the high-pitch ‘mosquito’, which only children and teenagers can hear, and a lower-pitch form which affects everyone. To counter this, carry a decent set of earplugs. Earplugs are inexpensive and can be bought from drugstores and hardware shops. This modern weapon heats just at the surface of the skin and causes intense pain. Its effects can be blocked by metallic-woven fibers. If a material pops and burns in a microwave, it should give some protection from this weapon. Lining a garment or cape with such a material or carrying a mylar space blanket (which may also provide very limited protection from infared cameras) should offer some protection against microwave guns. Carry the following gear in a compartmented bag with the following list at all demonstrations and posted with activists in safe houses. Do not use a tourniquet even if there is a severed limb, the vascular damage will often make limb reattachment surgery unsuccessful. Learn arterial pressure points (where you feel pulses inside the arm near armpit in in the inner leg) instead and save a limb. * roller gauze – for holding down bandages !never roll on tight! * adhesive bandages – Hello….. If you know a doctor, dentist, vetrinarian, paramedic, nurse, PA, or other person that can use it suturing equipment, IV sets and bags, and other serious medical gear for real emergencies could save a life if prepositioned in a safe house.